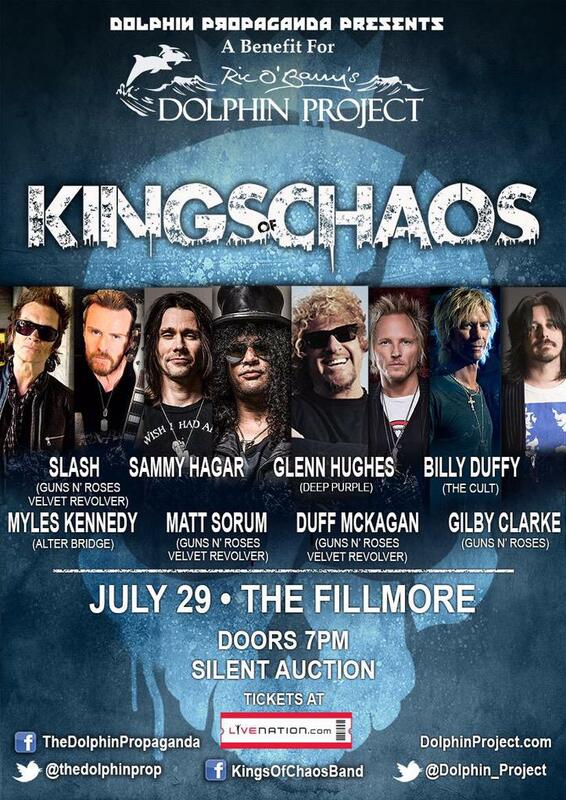 KINGS OF CHAOS will play a special show for Ric O’Barry’s Dolphin Project at The Fillmore in San Francisco, California, USA on Wednesday, July 29th, 2015. Rock band Kings of Chaos has announced they will perform in concert at The Fillmore on Wednesday, July 29th to benefit Ric O’Barry’s Dolphin Project, a not for profit campaign aimed at putting an end to dolphin exploitation and slaughter around the world. Mr. O’Barry and Kings of Chaos have joined forces to heighten awareness and raise funds for the Dolphin Project in the San Francisco Bay Area. The Kings of Chaos lineup includes rock legends Glenn Hughes (Deep Purple), Slash (Guns N’ Roses, Velvet Revolver), Sammy Hagar (Van Halen), Matt Sorum (Guns N’ Roses), Gilby Clarke, Duff McKagan (Guns N’ Roses, Velvet Revolver), Billy Duffy (The Cult) and Myles Kennedy (Alter Bridge). The supergroup will showcase its members’ collection of smash hits, as well as other classic rock favorites. General tickets and VIP packages will go on sale on Friday, June 12th at 10:00 a.m. via www.livenation.com, and all Ticketmaster outlets. Tickets are also available with no additional fees at The Fillmore box office on Sundays from 10:00 a.m. to 3:00 p.m. and nights there is a show at the venue. VIP packages include access to artist sound check, pre-show meet and greet with the band, and priority entry. Proceeds from the concert will be donated to The Dolphin Project. There will also be a silent auction of one-of-a kind music memorabilia, which will start at 8:00 p.m.